Eurostar tickets in Standard Premier and Business Premier class include a meal on the train. Some alcohol is available for purchase; you can also bring your own on board. See below for the Eurostar ski train alcohol policy. For vegetarian and child meals, Eurostar require a minimum of 24 hours notice in advance of travel. For all other meals, Eurostar require 48 hours notice. Unfortunately Eurostar are currently unable to cater for more complex dietary requirements, so you can only select one of the options above, not a combination. You can contact us, and we'll request a meal preference on your behalf. Please send an email to hello@loco2.com with the details of your request, including which passengers in your party require which meal. We'll contact Eurostar and let you know once it's booked. You can also request a meal yourself on Eurostar's site; please follow the steps below. 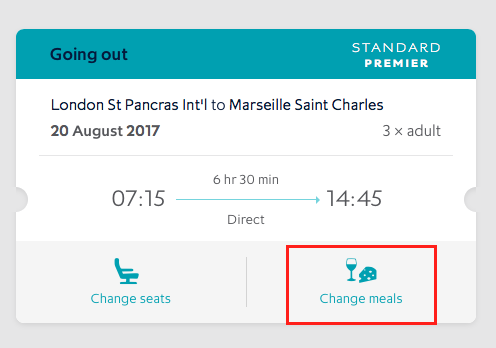 Go to Eurostar's page for managing your booking. Enter your PNR and the last name of any passenger on your booking and click "View Booking". Your PNR is a six-character code that you'll find in your booking confirmation email. It is different from your Loco2 order reference (Loco2 order number are eight characters beginning with “LO-"). Click "save". Your meal preferences have been changed and you are all set to travel. Each traveller can take 4 bottles or cans of beer, or 1 bottle of wine. No spirits are permitted. On these journeys, Eurostar doesn't sell alcohol on board or allow travellers to bring their own alcohol with them. For all other trains, passengers can bring up to 12 bottles of beer, 6 bottles of wine or 3 bottles of spirits. You can also use EuroDespatch to bring more with you.